This issue's cover illustration is from Lia's Guide to Winning the Lottery by Keren David. Thanks to Frances Lincoln for their help with this July cover. By clicking here you can view, print or download the fully artworked Digital Edition of BfK 189 July 2011. 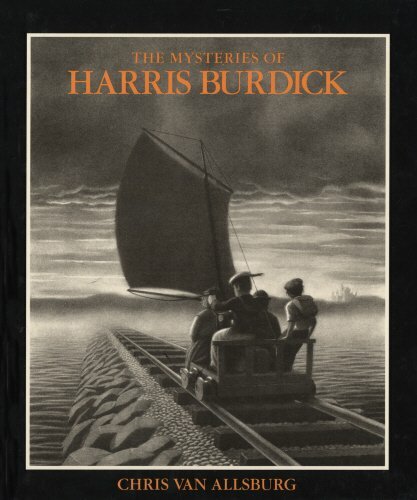 The brief introduction to this unique picture book explains that Harris Burdick vanished, taking a sheaf of stories with him but leaving behind one illustration from each tagged with an elusive caption. Sure enough, the chemistry of Chris Van Allsburg’s writing and illustration make it impossible not to get drawn into imagining the tales behind these rich double page spreads. Story stimuli can be written and illustrations can engage – witness the work of James Carter sparking the creative thinking of young writers. However, it’s the nature of these fourteen powerful black and white pencil illustrations that unsettle the reader into entering into what might be their back story. The scenarios are amazing, but, within them, it is the contortions of face, the play of light and dark, the details that require a better look – these are what stimulate in a book that will be viewed again and again. Beautiful, inspiring, disturbing and stimulating – a masterpiece of engaging literature.